Lineage Tracing of bone marrow adipocytes showing a positive red tomato signal. 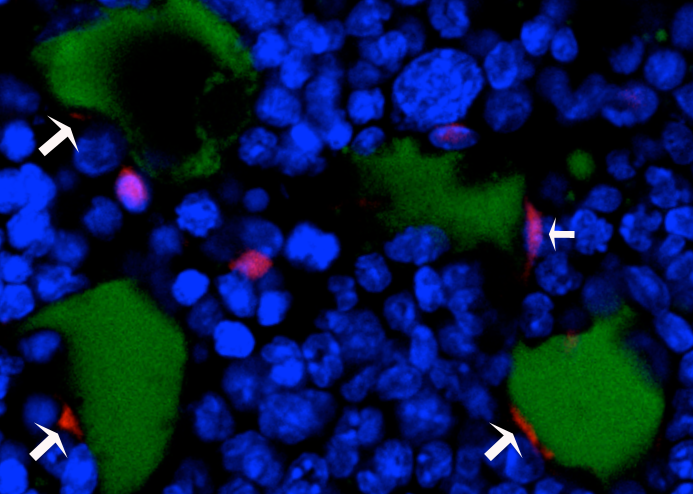 (White arrows ) in green Lipitox stained adipocytes. 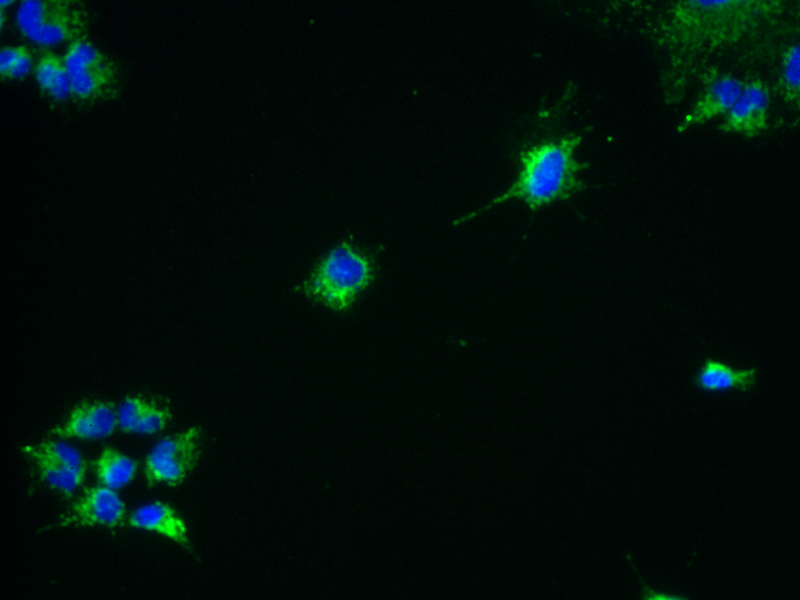 Blue represents DAPI stained nuclei. 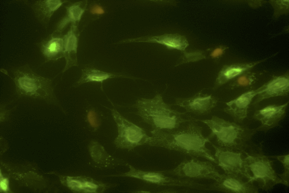 Immunostaining for CA3 (green) in osteocyclic cell line Ocy454. Blue represents DAPI stained nuclei. 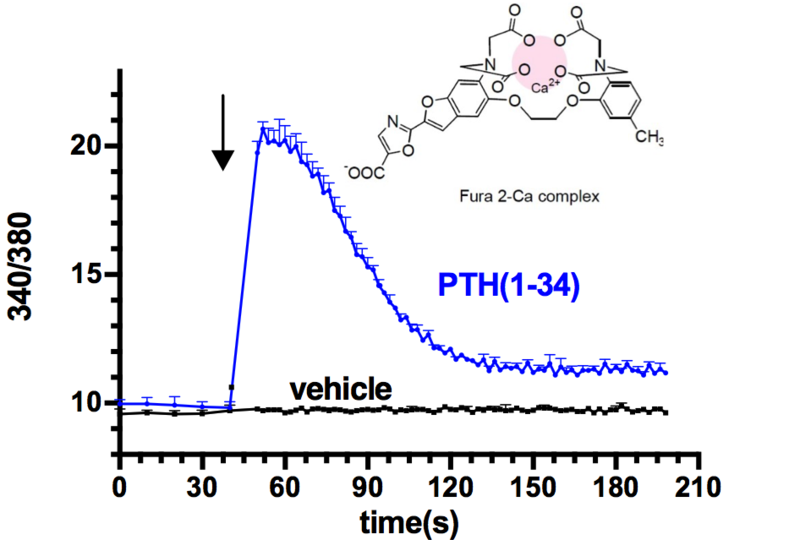 Fura-2 radiometric fluorescence assay of PTH-induced intracellular calcium signaling in HEK293/THR1 (GP-2.3) cells performed by the Cell Signaling Assay Core. 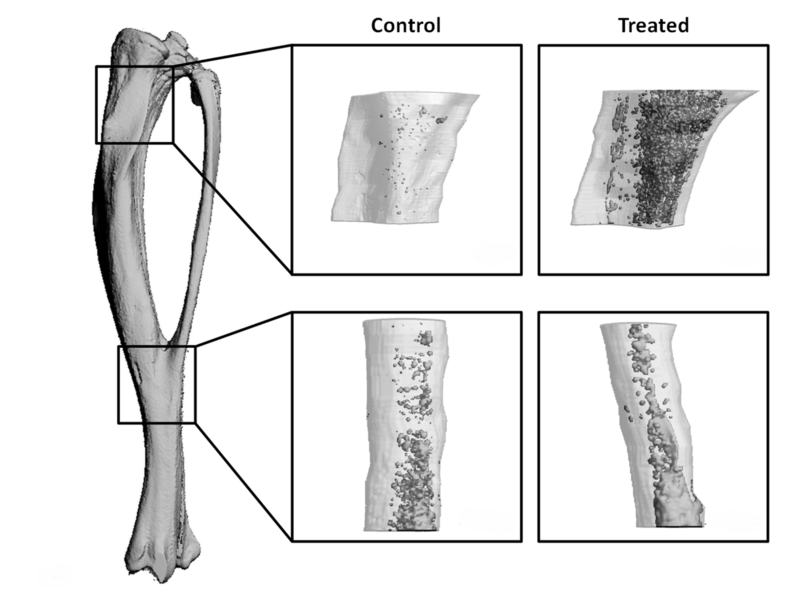 Representative 3D reconstructions of the trabecular bone in the distal femoral metaphysis of two genotypes of mice at four time points. This type of figure is great for demonstrating trabecular bone phenotypes in presentations and publications. 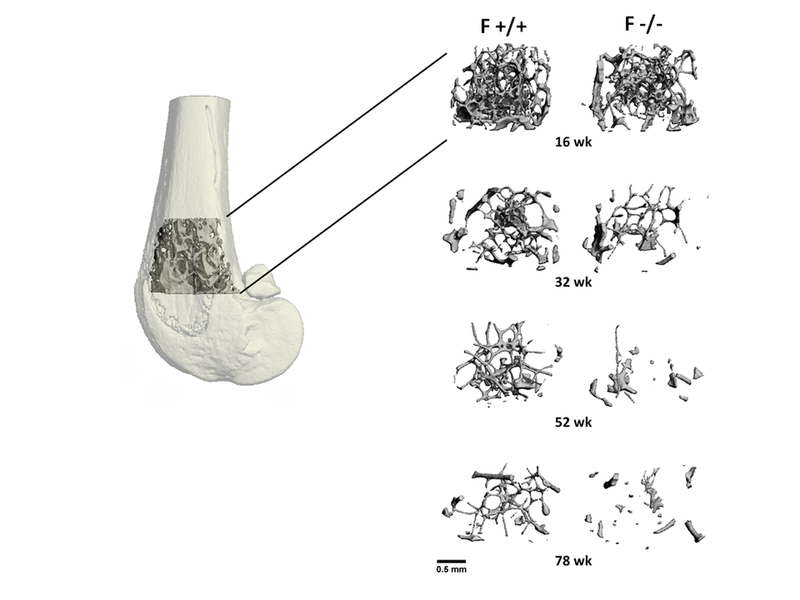 3D Reconstruction of the marrow adipose tissue (MAT) in the proximal and distal tibia of a control and treated mouse. The adipose tissue is stained with osmium tetroxide (dark grey in the images), which is radiopaque and can be images with µCT. 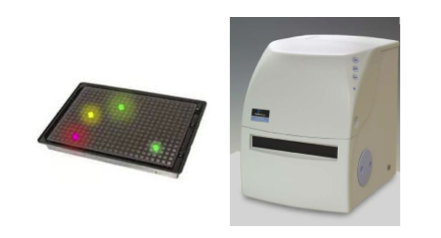 Osmium tetroxide staining can be quantified with µCT to measure the effect of study parameters on MAT volume. 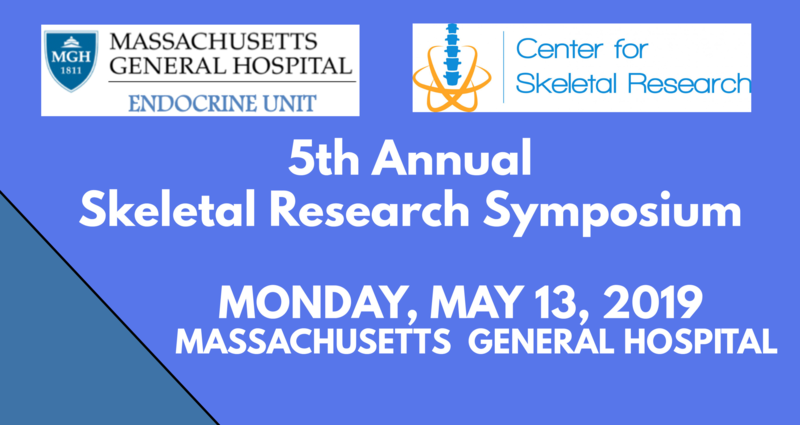 The Center for Skeletal Research will further the discovery of the causes and therapies for skeletal diseases through the provision of core facilities and other programs designed to make the work of a broad group of investigators more efficient, interdisciplinary, innovative, and interactive. 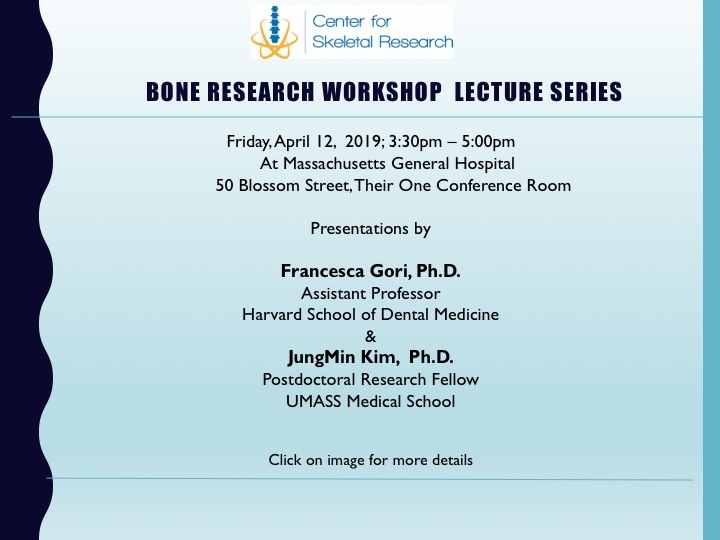 By making this research more effective, advances in understanding and therapy of osteoporosis and other bone disease will occur more quickly. 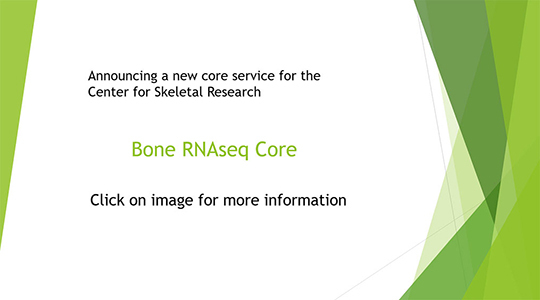 Remember to acknowledge the Center for Skeletal Research (P30 AR066261) if you received funding or services from our cores, see How to Cite P30.